A headache godsend!! I'm able to stop my headaches if I catch them early. Several years ago a PT gave me a series of neck exercises to use to help my headaches. The neck exercises are effective but when I have a headache coming on the last thing I want to do is be moving my head all around. It was unpleasant so I would avoid doing them and then end up with a full blown headache that lasted several days. 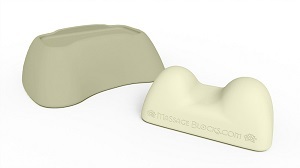 The Massage Block has been a much better solution because I can relax, shut my eyes and be still while I use it which means I'm more likely to use it right away. It typically takes about 15 minutes on the block to stop the headache. I think I've had only one severe headache in the several months since I started using Massage Blocks. That's incredible! It still works today as well as I when i first got it. Also, I cheat and use my neck block when I get knots other places in my back, especially my rhomboids (from being on the computer all day). I think it works great! I went for a massage last month at a business retreat and it was the first time in years that I didn't have a dozen knots and ropes I needed worked out. In fact, I didn't even need the massage. It was just for enjoyment. My co-workers were all complaining about their neck and back aches and pains and I didn't have any. Needless to say, I told them all about the Massage Blocks. I'm going to suggest them as one of our company gifts for next year's Retreat!